1 in 4 women experience domestic violence in their lifetime and statistically, those who are lucky enough to successfully leave make a shocking 7 attempts before they are able to reach safety. For people experiencing abuse in the cannabis community it can be harder to find safety, especially in states without cannabis laws. Abusers will use the threat of prosecution against their victims as a method to control and manipulate them. I believe an end to prohibition can help to lower the statistic of 7 attempts. 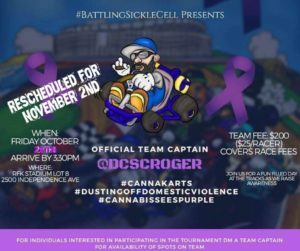 Join us Friday, November 2nd at RFK Stadium (Lot 8) members of the DMV Cannabis Community meet to race and raise awareness around domestic violence. Attendance is free All we ask is your support in sharing and bringing more awareness to an issue that plagues our communities but is rarely acknowledged.